Damn, this thing looks cool…. This thing is so near done, I can just about taste it! 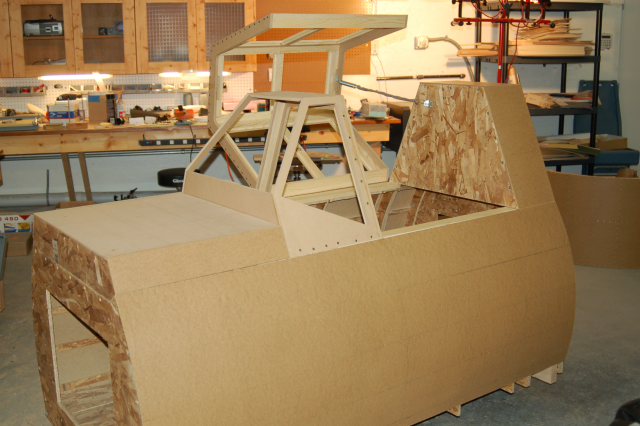 …and with the canopy open! Cockpit with the canopy open. 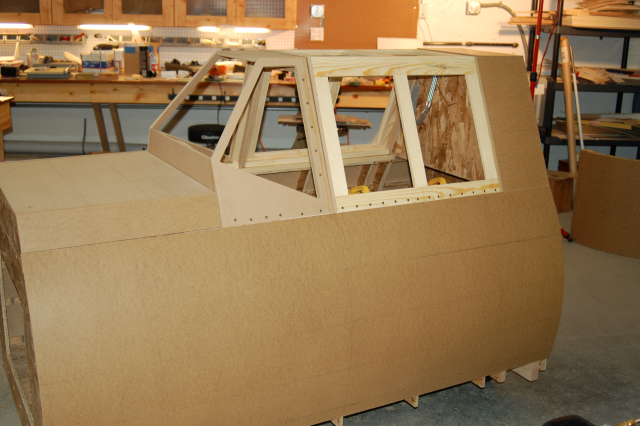 All the skin is now on the cockpit, the windscreen is completed and bolted down and the new canopy is completed. The skin on the side visible was glued & nailed in place with 5/8″, 18ga brads. It will be “arted up” with rivets at a later time. The cockpit is essentially completed. I need to finish the instrument panel shape, but that’s pretty much it! I hope to start work on the printed plan set and the instructions tomorrow. wonderfull job. Your BF 109 cockpit looks awesome. With the closed canopy the view will be reduced like in the real thing…. Do you think it would be possible to make the instrument work with the series of games IL-2 Sturmovick??? I’m lkooking forward to see more pictures and I will build a cockpit of the BF 109 if I can make it run for IL-2.. The view is very similar to what you’d experience in a Bf-109. There are some differences though – the cockpit wasn’t designed to be 100% scale. I chose the Bf-109 because it was a design that would be easy for folks to build. The instruction manual won’t include instructions on outfitting the interior – that’s up to the individual builder. There’s no reason you couldn’t use one of the existing IL2 utilities to drive an LCD monitor positioned behind the instrument panel.